I always thought that Glymm shipped out much later than TopBox, but I guess I was wrong (not that I'm complaining!!! Who doesn't love getting packages in the mail?) 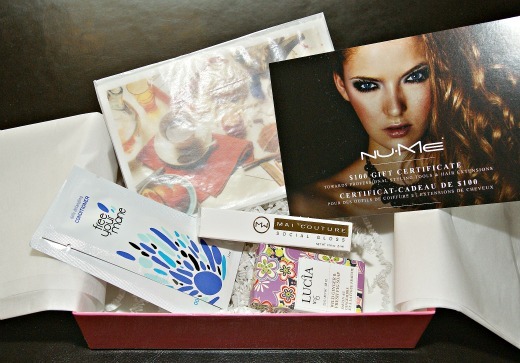 because I received my Glymm box just days after I received my TopBox. My first impression of taking out my Glymm box was, "wow...this box is awfully light". And when I opened it, I could see why....This month's box contained 4 "samples" and a gift card. I've been eyeing these soaps forever! Whenever I'm in ChaptersI make a beeline for them. I pick them up, smell them and then promptly put them back down when I sneak a peak at the price - always hoping that it'll magically drop a 0 on the price tag. So I'm pretty happy that I got a "hotel" sized bar. Here's a dirty little secret - I hoard soaps (I guess it's one of the many things I hoard) like, if the world was ending tomorrow and only those with a bajillion bars of soap would survive. Not only would I survive, my whole family and extended family would survive. What can I say? I'm a bit of a germaphobe. And I like soap. Full Size : $17.50 for a pkg of 8 soaps (I'm assuming that they are the size of the sample). Sample : $2.19 for one bar. "Atlelier Cologne is a niche perfume house based in Paris and New York. Each scent is intended to embody a singular moment of memory and experience." Ummmm....well, the only memory and experience I'm going to associate with this smell is of me sitting in front of my computer with my huge honkin'DJ headphones on (bobbing to music of course! ), typing this out as I smell it. Though, I can understand what they are trying to say. Whenever I smell Tresor, I think of my trip to a perfumery in Paris (no, not Atlelier Cologne). Anyways, this scent is nothing but oranges. ECK......If I don't like the smell of oranges on my hands after I have some, I'm definitely not going to like them on my body. Plus, you all probably know how I feel about these small perfume samples by now. If not, check it out here. Or here. It did come with a cute little postcard. *SIGH*. First, let's start with the positives. This shampoo and conditioner are sulfate free and seem to have a lot of natural products listed on the ingredients list. Negatives: C'mon! These are tiny little samples that are probably one time use. How can I possibly judge whether or not I like your product? Plus, I think that my conditioner has a hole in it somewhere because it's kind of leaking and leaving an oily residue over everything. I believe in last month's box I received Mai Couture Bronzing blotting papers, so this month, I received lipgloss. Another product that I don't really use...though lately, because I've been receiving so many glosses, I've been forcing myself to use them. This gloss is a beautiful light pinky-peach with flecks of gold shimmer. The smell of this gloss reminds of cake, but it definitely doesn't taste like it....don't ask. It's a very thick and heavy formula, so hopefully it won't migrate too much off my lips. It's a little tingly and very sheer. Sample: $28.00 full size sample. Took a browse on their website and I couldn't find any kind of information about shipping costs (it's always the first thing that I check out). Then I took a look at their products. Honestly, there wasn't much. I had just purchased a bunch of professional hot tools, so I'm not really in the market for more. Plus, my hair is so long that I don't need extensions. I'm trying to not be critical, but I'm SO disappointed with this month's Glymm box. So so so so so disappointed, regardless of the total cost of samples received. Total for April's Glymm Box: $130.97 (yes, I'll include the gift cert in there, just in case I do end up using it). 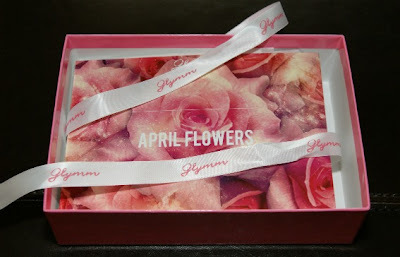 April's Glymm Box Rating: 2 out of 5. What did you think of this box? Are you subscribed to Glymm? Did you like yours? Overall, I am not a huge Glymm supporter. I think they have a slightly better track record than Luxe, but the boxes are very hit and miss. I am sorry you didn't enjoy this months box. I agree with you- that lipgloss retails for $28.00?! No wonder they're giving it away for free- no one is buying it at that price! haha. ;) maybe you could give your giftcard to a friend who might use it so it doesn't go to waste? I started out really liking Glymm over Luxe, but the tide is changing! I think that I'm probably going to give it two more months and then axe it if I can't get one good month out of the two. That's a great idea! I'll try and see if any one wants the gift cert! Thanks! I'll be getting my Glymm box this week and yes, it doesn't look very exciting...I'm subscribed for a year so I'm sort of stuck with it for now. Fingers crossed for next month I guess!